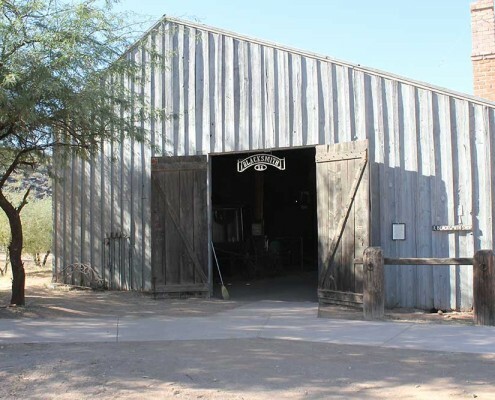 This is a reconstruction of Middleton & Pascoe’s shop which stood in Globe, Arizona. 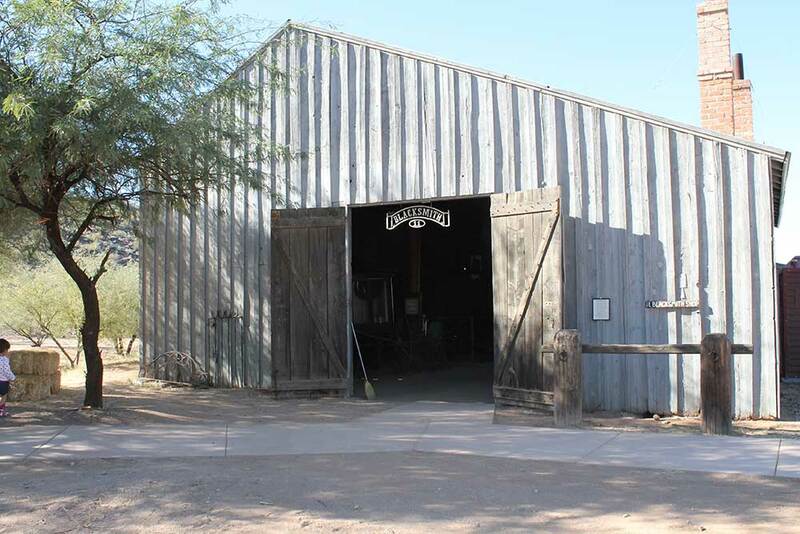 Our blacksmith shop is based on a photograph taken during the 1870’s. The double doors at the front and back are wide enough for a team and wagon to pass through, and the floor is packed earth. The blacksmith’s profession of working wrought iron is over 3,000 years old. Originally, he was a maker of tools, hardware, and other useful and decorative iron implements. He also made horse-shoes; however, these were fitted and applied by farriers. A blacksmith was important to 19th century life and was often called upon to repair damaged equipment, forging new pieces whenever necessary. In the early 19th century, manufactured cast iron objects began replacing those handcrafted of wrought iron, and the trade diminished. 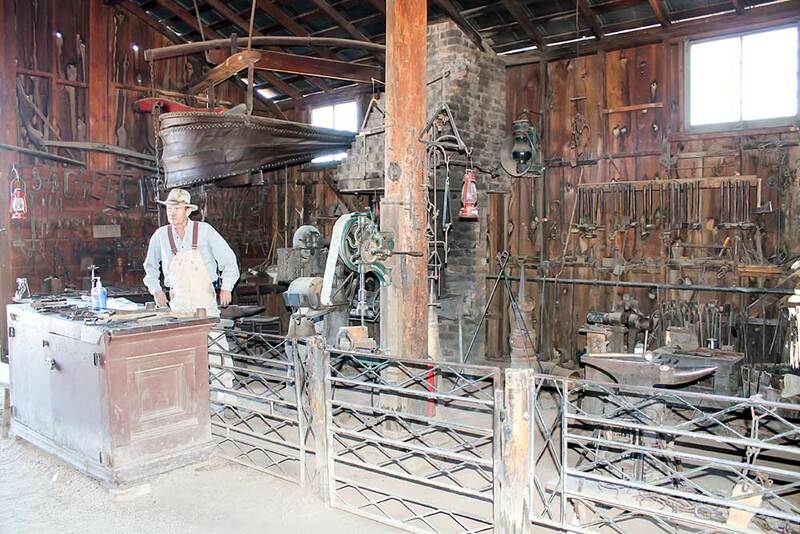 The blacksmith then assumed the farrier’s duties in addition to his own. His work became mainly concerned with the shoeing of horses, carriage work and repair of implements. 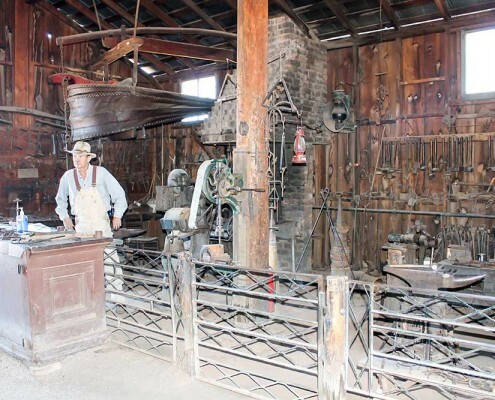 In the closing years of the 19th century, repair of the new fragile horseless carriages became an additional duty, and the blacksmith shop was, in reality, the original service station. The equipment of the late 19th century blacksmith included the forge with its fire for heating metal, the bellows for forcing air through the coals and creating the desired heat, a barrel of water for quenching red hot iron, and the anvil on which the metal was pounded, shaped, and formed. However, the most important tool of the trade was the blacksmith’s hammer.